Well well well.... here we are on the brink of a new year and all I can think about are handbags. I got this Guess - Shania handbag a few months ago and still have not taken it out of my closet! I love all my Guess handbags and although I do love this one, it's not what I would grab at first thought. I like my bags like I like a lot of things in my life... BIG, BRIGHT, and SHINY. 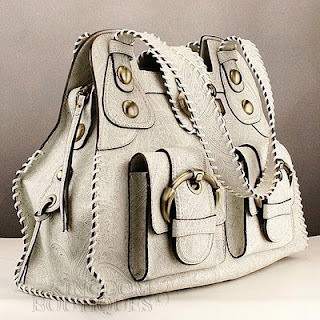 I do love this bag and upon googling it to see if I got a good price on it I realized that I got a smoking deal on it! It's my mom's 60th birthday today. Most people would agree that it's quite a milestone, and so I wanted to make her a cake that was elegant, classy, and feminine. At first I didn't want to make "another" pink cake. But white just didn't bring the pearls out. And I don't like yellow for some reason on cakes. Anyways, after dropping the top tier onto the bottom one and yelling an expletive word in front of my kids, I managed to fix it up as good as I could. Oh BTW, I really hate those frosting sheets by cricut. Useless in my opinion. Could not cut one good image on them so instead I had to hand pipe everything! Inside is mango icing with golden cake and pureed mango. Outside is pink buttercream with sugar pearls and chocolate fondant accents. I love you momma! Happy 60th!